It’s the time of year when lawns tend to be at their least attractive. The elements have sought to attack them with the worst that autumn and winter can throw at it: rain and frost, and worst of all, a blanket of compressed snow that suffocates and deprives it of sunlight. By the time late January comes and our minds are being turned to thoughts of gardening again, the poor old lawn appears to comprise of a few straggly ends of grass peering over the top of a fuzzy mat of thick moss. Moss often takes hold when the grass has been regularly kept short over the year and warm, wet weather means that the soil beneath clogs up and allows the moss to take hold on top. It becomes a vicious circle: more moss means less light and less air to provide grass with the nutrients it needs, the grass dies off thus giving more space for more moss. 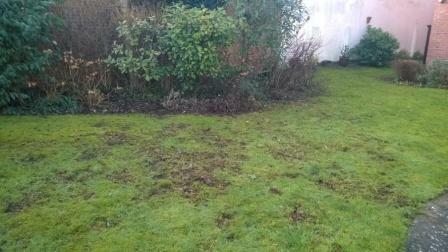 The moss also stops the soil from being fertile for worms who provide nature’s way of aerating the soil. The answer? Scarification, the application of a suitable fertiliser or other soil treatment and possibly supplementing the surviving grass with additional grass seed. The scarifier will take off the thatch of dead grass and springy moss that has been suffocating the soil. It will also aerate the soil by removing small plugs of soil to allow light and air in. It won’t look pretty to begin with and it is a long process but can save your lawn from a need to re-turf in the future.